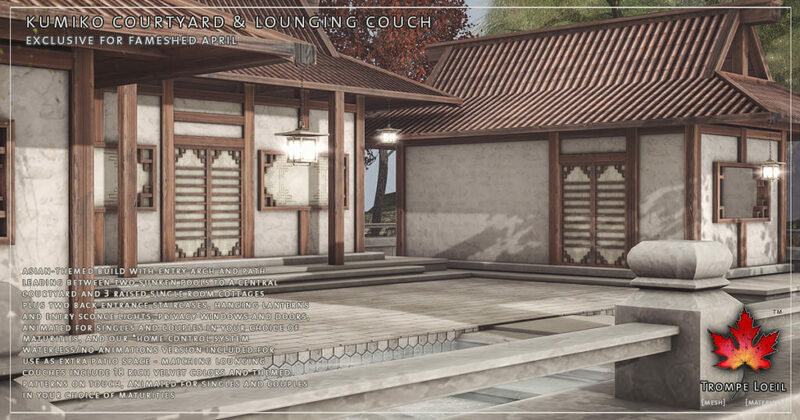 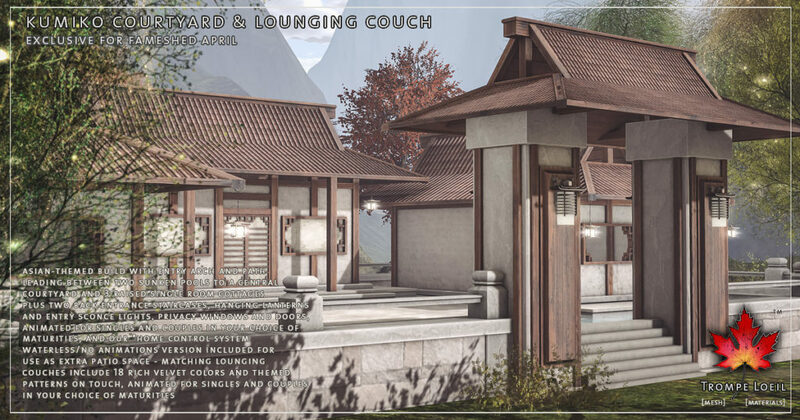 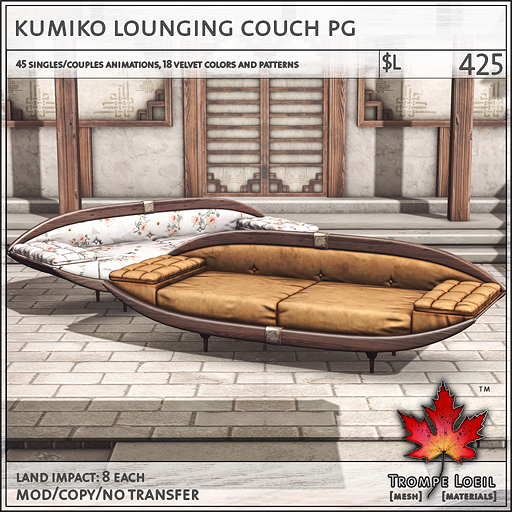 Enjoy the tranquil privacy of minimalist lines, raw wood and concrete, and two crystal clear pools to usher in the season – the Kumiko Courtyard and matching Kumiko Lounging Couch for FaMESHed April! 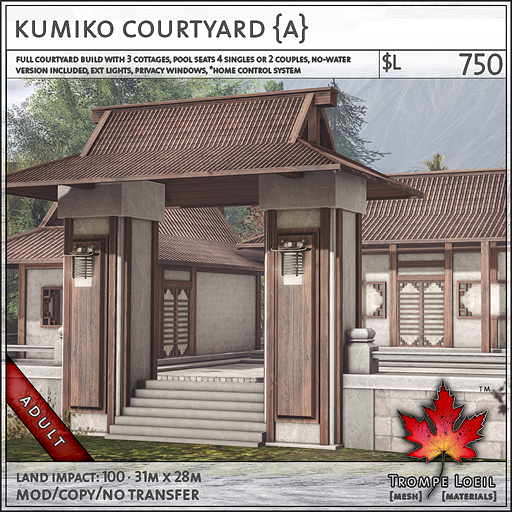 The Kumiko Courtyard is an eastern-styled build that welcomes you with an oversize entry arch and staircase leading to the central pathway running between two pools. 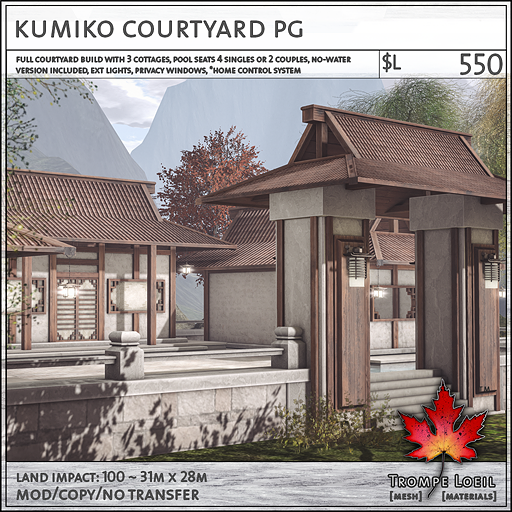 Continue to the central cobblestone courtyard, surrounded by three single-room wattle and brick cabins, or explore the back staircases on either far corner. 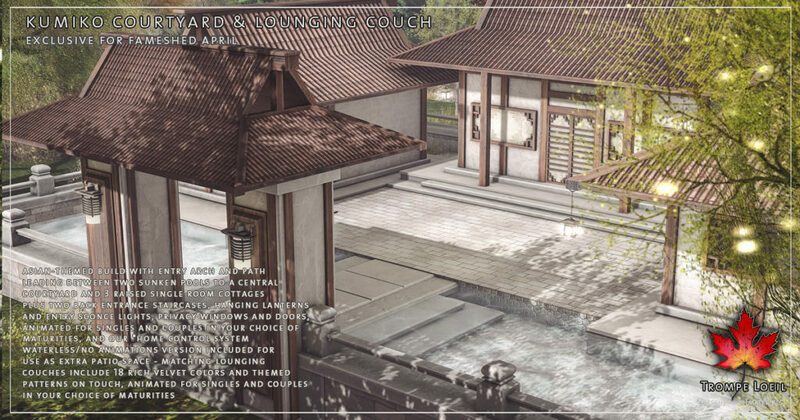 The pools are animated for singles and couples and are available in your choice of maturities, or use the included version with no water effect or animations, for extra patio space to create your own sunken conversation areas or outdoor living spaces! 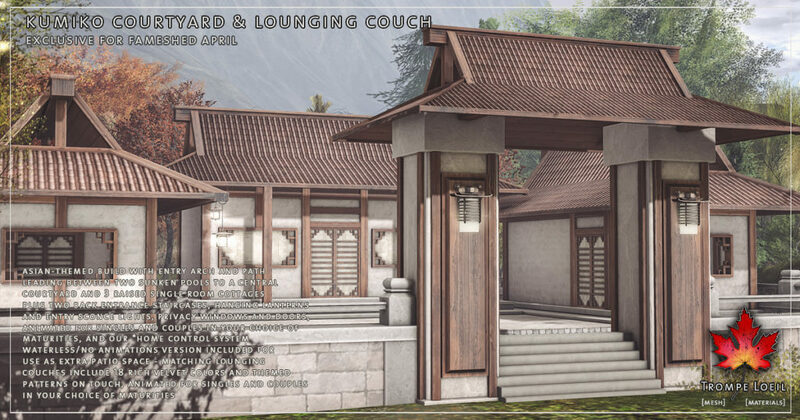 Exterior hanging lanterns and wall sconces, privacy windows and doors, locking doors and our *home control system round out the list of features. 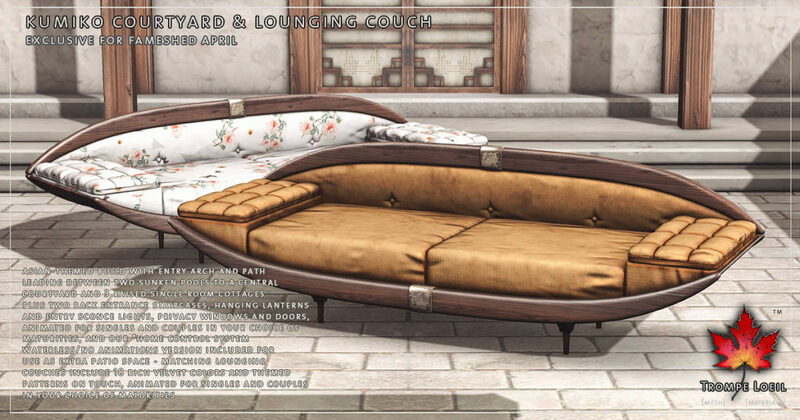 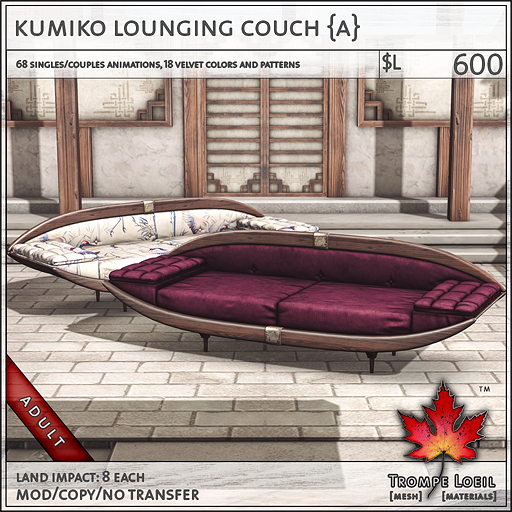 Plus, the matching Kumiko Lounger Couch is a richly appointed, asian modern style seating showcase, animated for singles and couples in your choice of maturities, and including 18 rich jewel-like velvet colors and thematic pattern options on touch menu! 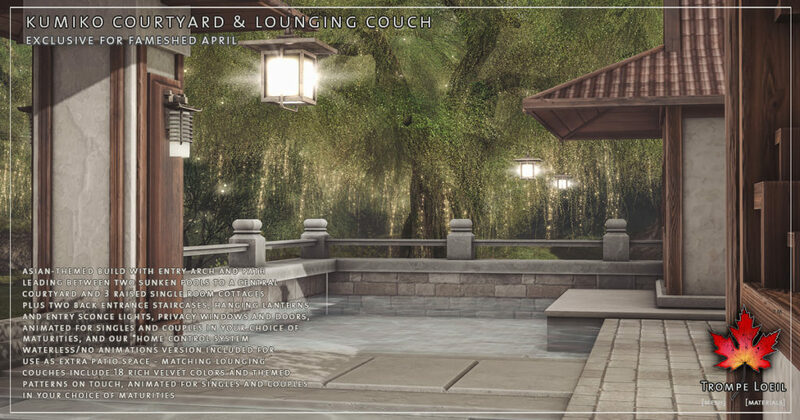 Check out the demo on-site at FaMESHed’s April round or at our Mainstore, and pick it up exclusively at FaMESHed for the month of April!